This is a story about locating a piece of smoking-gun footage that aired in the 90s on the TV show Sightings about the Socorro New Mexico UFO case witnessed by Lonnie Zamora. The film footage in question shows smoking embers left behind from the craft that Lonnie Zamora witnessed, as well as landing pad impressions in the sand. Also, there is a little girl in the film who would later grow up to see the Socorro incident profiled on the TV show Sightings in 1992. The story begins in Cherry Hill, New Jersey when Tony and Ben attended the 2014 MUFON Symposium this past August. While watching a presentation by James Fox, he mentioned the Socorro, New Mexico incident that was part of the 701 cases that the Air Force Project Blue Book had not been able to classify as anything other than unexplained or unknown. As the presentation progressed, Ben felt he knew what scene was about to come next. He believed it would be the footage that he had seen a long time ago on the TV show Sightings. He said to Tony, “In 1996, I was watching Sightings with Tim White and I know we are about to see some cool footage of a burning bush and pad impressions”. “The Lonnie Zamora incident was a UFO close encounter of the third kind which occurred on Friday, April 24, 1964, at about 5:50 p.m., on the southern outskirts of Socorro, New Mexico. Several primary witnesses emerged to report stages and aspects of the event, which included the craft's approach, din, conspicuous flame, and physical evidence left behind immediately afterward. It was however Lonnie Zamora, a New Mexico State police officer who was on duty at the time, who came closest to the object and provided the most prolonged and comprehensive account. Some physical trace evidence left behind—burned vegetation and soil, ground landing impressions, and metal scrapings on a broken rock in one of the impressions—was subsequently observed and analyzed by investigators for the military, law enforcement, and civilian UFO groups. The event and its body of evidence is sometimes deemed one of the best documented, yet most perplexing UFO reports. It was immediately investigated by the U.S. Army, U.S. Air Force, and FBI, and received considerable coverage in the mass media. It was one of the cases that helped persuade astronomer J. Allen Hynek, one of the primary investigators for the Air Force, that some UFO reports represented an intriguing mystery. After extensive investigation, the AF's Project Blue Book was unable to come up with a conventional explanation and listed the case as an "unknown". The footage shown in that episode is an important piece of evidence, and it shows the after effects of what Lonnie Zamora described. It would also help clear up the recent story that this was a hoax by some local college students using a candle in a plastic bag theory. Obviously, such a prank would not leave indentations, burning bushes, or completely fool respected people like police officer Lonnie Zamora, Dr.J. Allen Hynek and Ray Stanford who were all part of this most documented UFO case in history. When James finished his presentation and did not mention or show this footage, Tony and Ben knew they had to tell him about it. During the break between speakers, they met him and his producer, Anthony Cataldo who is also a MUFON board member. They mentioned the footage and neither of them had ever heard of it. James did say that he interviewed a family that was in the area, but we were not sure if this was the same family that had the video. After we talked a bit, James said that if this footage did exist it would be a great addition to his movie “701”. Ben talked to several other people at the symposium and none of them remembered seeing the episode. Ben knows what he saw and told James that we would find a copy for him. Easier said than done! We began searching for this episode by using Google, Bing, Yahoo, Ask, AOL, and Web Crawler, among others. What we found was that several sites appeared to offer the show Sightings, as well as listing every episode by season. Ben was so excited to start streaming the show that he entered his credit card information as required, only to find out they really did not have it. Ben called Tony to tell him what happened, only to find that he had done the same thing. Luckily, we did not lose any money as we were able to cancel the subscriptions right away. It seems that there are many websites that will say they have whatever you are looking for just to get you to sign up. They use algorithms that take your search text and link it to a database of shows or movies. Then they pull metadata on that search to make it appear as if it’s available. Ben posted a plea for help on various Facebook pages including: Mufon, the Private Investigator Mufon page, Coast to Coast, and many others asking for any copies or leads with regards to the episode. Several people said they had copies, but nobody could produce the one regarding Socorro. Many suggested searches and places that we had already covered. Tony contacted iOffer.com and purchased what turned out to be a random set of 15 DVDs of Sightings episodes. The episode we were looking for was not included and an email conversation with the site’s seller did not uncover any more copies of the show. Soon after making this purchase, the seller was banned from the site for bootlegging the DVDs. We had nothing to do with that. Recently, a woman watching The Sci-Fi Channel's program “Sightings" saw the Lonnie Zamora story and remembered having been there as a child, along with her father while vacationing. She went through her attic looking for a roll of 8mm movie film and found color footage taken by her father of the landing site, documenting the scorched brush and landing pod depressions. 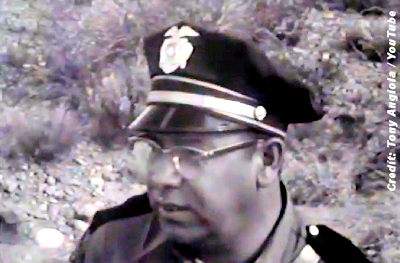 The footage was aired on the program and represents another solid piece of evidence supporting the Zamora UFO encounter. So, at this point, the real search began. We went online and checked: eBay, Amazon, Los Angeles TV archives, and many other holding companies, as well as TV related content providers. After having no luck online, we started to research the show’s producers, various networks (beginning with the one it aired on - which was Fox) and anyone else that was attached to the production of the series. Tony called Linda Howe, a well-known UFO researcher and producer who was involved in the pilot of the show. She also referred us to Fox and Paramount. Linda was on the show and we thought that she might have some insight, but after the pilot she did not have much to do with the direction of the show. Dear Ben.Thank you so much for reaching out to us. I'm sorry but the function of this customer care center is to address questions/concerns around authentication and technical support. Ben, you can also contact the network directly for your concern at feedback@syfy.com. I hope this helps address your concern. If you have any questions, comments, or concerns regarding this issue or any future issue please do not hesitate to email us back. We will be more than happy to assist you. Tony reached out to a producer in L.A. who was just finishing some work on a short film. He informed us that Brookwell-McNamara Entertainment was involved with the show. Several calls to this company did not yield any return calls. Ben: I am working with James Fox, trying to locate some footage that I saw on your network in the 90's for his now in production movie "701". The particular show is season 4 episode 13 of "Sightings". Can you assist in getting me a copy of this episode and discuss licensing rights? We are particularly interested in the piece of footage that aired on this episode filmed by a family that was in Socorro, New Mexico during a UFO landing event in 1964. I am trying to receive and/or view a copy of this particular episode. Peter: There wouldn’t be a way to view the episode unless your request was approved and a deal was in place for licensing. That being said, given that this has a ’96 date attached to it, I would contact CBS Syndicated licensing at the email address provided and inquire. They may have a different policy. Ben: Does your response mean that you cannot locate a copy of this season 4 episode 13 and that I have to contact the licensing department to secure one? I really would like to view the episode to make sure that the piece I am seeking is in there. So I guess what I am asking is there a way to view the episode, make sure the piece is there, and then go down the road of licensing? It appears that the early ‘90s version belongs to us. The version that aired after ’94 is licensed by our Syndicated Licensing Dept (ctdcliplicensing@cbs.com). What version are you seeking? Television properties may not be licensed for public screenings regardless of whether your event is for profit, not for profit, large in scale or small in scale. We do not handle licensing for CBS News, CBS Sports, CBS Radio, Domestic Produce Sales or International Product Sales. CTD: What information do you have that leads you to believe that the episode you are seeking is from Season 4, Episode 13 of the program Sightings? Can you provide us with additional information regarding the segment you are seeking to license such as names, dates, locations, etc.? Ben provided all the background information he had. CTD: There are a few issues with your request. Our records regarding the series Sightings are very limited and sometimes like trying to find a needle in a haystack. Having said that, the first issue is that show numbers for the series are not listed as Season 4, Episode 13 so we would not be able to find the episode based on that information. The second issue is that according to the article, this woman saw the program Sightings and then went into her attic and found the 8mm footage that her father shot when she was a child. If we understand you correctly, you want the footage from this woman, but you claim the footage would not have been used in an updated episode but would have been used in the original episode. If the woman was watching the original episode (as reported in the article), then her footage could not have been used in the original episode. The third issue is that we cannot legally provide or license third-party footage, so even if we were able to locate the episode, we would not be able to provide you with the footage. Having said that, we can try and search for the footage by the woman’s name and, if a match can be made, we will provide you with her contact information so that you can license the footage from her. Well CTD, did not read Ben’s email very carefully and this response seems to indicate that we are confused about which episode the woman watched and which episode we are seeking. Clearly someone is not taking the time to help us here. CTD tries to put a positive spin as if to get rid of us by stating, “we can try and search for the footage by the woman’s name and, if a match can be made, we will provide you with her contact information so that you can license the footage from her.” We know that no such effort is going to be made. So, here we are in late October of 2014, and we still are not able to locate this footage. We would ask anyone to contact us if you have any copy of this episode, or contact information of the family that filmed at Socorro in 1964. It has been journey looking for the lost episode up to this point. However, the effort is worthwhile as we feel the footage is critically important to the case. All these dead ends have to make us wonder if there aren’t larger forces at play attempting to keep the footage from the public. We feel the only way we are going to find this footage is by reaching out to fans of the show in hopes that someone recorded it on VHS and still has it. We need your help to expose the truth about this case! Recently through the efforts of a growing number of eager Mufon members we were able to secure and watch 'Sightings' episode 13 season 4. It does contain some valuable information and film about the Socorro landing case. Unfortunately the long sought for 3rd party footage was not in this episode. So now our focus is on anything after this show which would include the rest of 1996 season 4, 1997's season five and the 5 special episodes from 1998 presented after show was canceled. I have scanned all of the titles beginning with show 15 from 1996 to the last show and do not see a specific reference or update concerning the Socorro Incident. But somewhere on one these shows is the film, since it is now clear that the woman saw this episode 13 and then remembered her father's film and found it in her attic. The goal is now to find and watch each show until we finally see this important piece of history caught on 8 millimeter film. Thanks for posting our article. Obviously we did find the footage, and our update that we wrote will be posted here next month. Ray Stanford; a name you can tie to legitimate UFO research. Someone that used to talk to aliens telepathically. Someone that used to live with a known UFO fraud (George Adamski). Someone who said that an alien teleported his car 30 miles away. Someone that invented an egg shaped time machine. Stanford is a nutbag just like Billy Meier & Adamski. Fraud/Hoaxer/Scammer.